Is PlaySALottery a Scam or Legit? Read Reviews! There are plenty of websites that promote the selling of lottery tickets online, but few of them use the cell phone number for registration purposes. This first step in the registration process will leave you a little puzzled, but it does get more evident as you go on. PlaySA Lottery goes to great lengths to emphasize the fact that their system is straightforward, but until you visit the “how to register & play” section you are pretty much in the dark. Players must have a South African cell phone and ID to be able to play! They state quite clearly that they are the premier source of tickets for South Africans who want to play the national lottery either online or through SMS. Thankfully, if you are a foreigner and want to play a South African lottery, you can go to an online lottery provider like TheLotter.com! Playsalottery.co.za say that the law demands them to require some necessary information in advance and this is where the South African ID becomes mandatory. Registration requires your full name, ID number and cell phone number when setting up an account. New players are also instructed to set up a wallet using pWallet. These are the guys who are going to administer your money in purchasing tickets and collecting winnings. You can make deposits to ‘your wallet’ through various methods including credit and debit cards, EFT or Internet bank transfers. You can even do it the old-fashioned way and deposit money into ‘your wallet’ at a local bank. What’s the Deal With the Cell Phone Number? Play SA Lottery presents its members with the opportunity to buy tickets and place wagers using their cell phones. They also say they that this cell number will be used if the system wants to talk to you. They don’t explain what the system is and why exactly it wants to talk to you about anything. The cell number will be used as a reference when depositing money regardless of what deposit method you prefer so if you are South African and registering at this site, make sure you give them the correct number! An important notice comes up relating that the cell number is essential for the servers to process any transaction including customer support. Play SA Lottery stresses clients that they should call customer support from their registered cell number or they will have to wait for a customer support specialist (business hours only). There is no question that the South African lottery is genuine and the official website is simply carrying out the operation of setting tickets online and via SMS. Complaints are not numerous, and they don’t revolve around the lottery vendor trying to deceive the players in any way. Would you mind rating PlaySALottery.co.za? 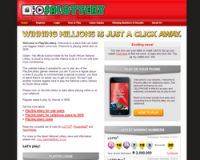 This is a fairly straightforward online lottery provider for South Africans, for South African lottery tickets. That’s it. The bottom line is you have to be South African and in South Africa to be able to play online or through their SMS system – Internationals not welcome! Okay, I get that this is only for South Africans and only for South African lotteries. What I do find interesting is how much this all relies on having a mobile telephone. Guess more people have those versus computers. The connectivity is great to see. What's the Deal With the Cell Phone Number?